Description and Definition of Spears: Spears are one of the most ancient instruments of war and hunting consisting of a long handle, or shaft, with a sharp spearhead or projectile point. Native American Indians would use to spears to strike, thrust, slash or to takedown their enemies by effective use of this simple weapon as a missile. Most Native American spearheads tips were originally made of a hard stone, such as flint, but were replaced by metal points. Spearheads were made similar to arrowheads, only larger in size and somewhat different in shape. Some spears were made of hard wood and the wooden point and hardened in a fire. The spear eventually developed into The Lance. The difference between a spear and a lance was its size and its purpose. A Native American spear was used to to strike, thrust, slash or thrown to takedown their enemies. The handle of the spear was much shorter than a lance, as were its sharp head or point. The lance was designed for use on horseback and measured from 9 to 14 feet in length. The blades of a lance were also generally longer and wider. Spears used for thrusting or slashing an enemy may be used with either one or two hands and tend to have heavier and sturdier designs than those intended exclusively for throwing. Throwing spears, often referred to as javelins, tend to be lighter and have a more streamlined head. Native American throwing spears were either thrown either by hand or with the assistance of a spear thrower such as the Atlatl. 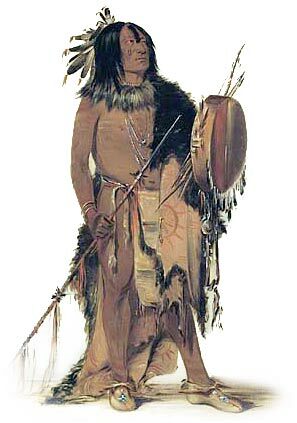 The atlatl spear thrower was used by the Pueblo and Creek Native American tribes and tribes based in the Arctic and Sub-Artic regions. Spears required minimal natural resources or technology to construct. Spears were decorated with care using carvings or paints to depict special symbols and were often embellished with feathers, horsehair, fringes, beads and often had the fur of a slain animal attached. The decorations were often added to spears used in ceremonies and spiritual dances and were considered status symbols. Some spears were decorated with scalps taken from victims slain in battles. Ceremonial Spears were made as part of the regalia of a warrior. These Spears were decorated with symbolic colorings and markings which were significant to the owner. These ceremonial Spears were symbols of power and authority and carried into battle as a weapon and for their protective power. Making a handle for Spears: The handle was made using a hard wood or different types of bone or horn including the elk horn. The hardened woods used to make the handle included hickory, juniper, oak, cedar, maple, ash, walnut and birch. Making the spearhead: Spearheads were the projectile points, added to spears, which were made in a number of different shapes. The spearheads were made of stone, bone, antler or metal and fixed to a spear, called 'hafting'. Tanged points are projectile points that have a tang at one end to facilitate hafting.